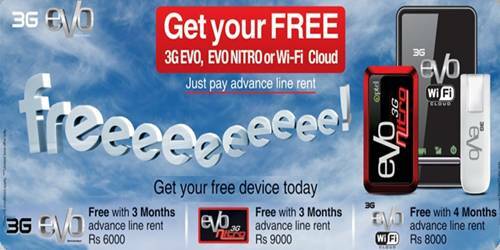 You can get Evo device of your choice just by paying advance line rent of specific period (3 to 4 months). PTCL announced this amazing and super cool offer for new Evo customers. PTCL is offering 3G EVO, 3G EVO Nitro and 3G EVO Wi-Fi Cloud devices absolutely free just against advance line rent for specified time period. The offer is applicable for new postpaid customers only. Offer is not valid for EVO prepaid, EVO Tab and EVO Smartphone users. Promotion is valid for all EVO (Prepaid & Post Paid ), Nitro & Wi-Fi Cloud Sales only. For Advance billing package, customer will have to make advance payment of Rs.6000 , Rs.9000 & Rs.8000 for EVO, NITRO & Wi-Fi Cloud Respectively in advance at the time of availing this offer at any PTCL OSS. For PSTN billing package, customer will have to pay 3 months advance line rent for EVO & Nitro and 4 Months Advance line rent for Wi-Fi Cloud at the time of purchase (unlike normal PSTN packages). For PSTN billing package, the customer shall not be billed EVO charges in his PSTN bill for the first 3 months; billing shall start from the fourth month. Promotion is valid for sales made through PTCL In-house(OSS) and National distributors only. Promotion is not valid for sales made through franchises and other in-direct sales channels. Promotion is valid for Evo , Nitro & Wi-Fi Cloud Commercial Promo packages only. Promotion is not valid for Employee & other discounted packages. With advancement in mobile communications, mobile gaming, as well as mobile applications development it's difficult to pin point new and creative ideas for development as far as mobile communications is concerned.